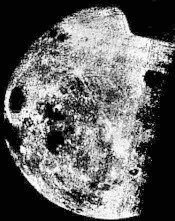 Satellite exploration of the moon began in October 1959, when the Soviet probe Luna 3 sent back the first photographs of the 41% that is invisible from earth. Although of very poor quality, they showed a surface more heavily cratered than the side that faces earth, and none of the large, basalt filled ‘seas’ (or maria) that characterise the near side. The reasons for this difference are still not fully understood and a number of hypotheses have been proposed to account for them. 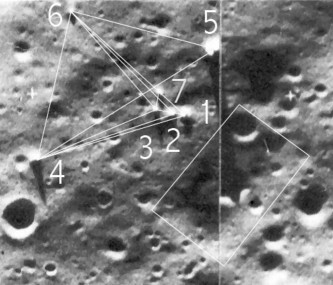 Subsequent explorations involved orbiting probes that undertook systematic surveys of the lunar surface. The main rationale seems to have been less for pure selenography (the lunar equivalent of geography) than for identifying potential landing sites for the projected American Apollo missions and manned Soviet missions. 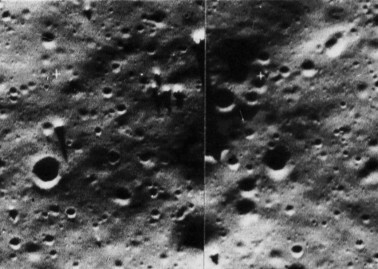 The American Lunar Orbiter programme (consisting of five separate probes launched between August 1966 and August 1967) surveyed some 95% of the surface of the satellite. The first two Orbiters concentrated on a band extending 5° north and south of the equator and 45° east and west of the prime meridian. This was considered to provide the best location for the first Apollo mission to land on the moon, Apollo 11 in July 1969. Other sites were also pre-selected at this time for future missions. On 2 November 1966, NASA published a photograph of a region towards the western edge of the Sea of Tranquillity taken by Lunar Orbiter II (reference number LO2-61H3) at approximately 15.5° E 5.1° N. William Blair of the Boeing Institute of Biotechnology drew attention to a number of apparently anomalous features in the photograph, mainly a series of objects that cast long, clear shadows, contrasting them with the shorter shadows cast by objects that were more obviously boulders. Blair compared the shadows with those cast by Egyptian obelisks, causing him to suggest that the photograph shows a series of spires. Moreover, the seven objects are arranged in a geometric pattern, with right-angled and isosceles triangles. Close to the ‘spires’ was a feature that resembled an eroded rectangular trench. The photograph seems to have attracted little attention at the time, although it has been reproduced – poorly – in a number of publications. A second photograph of the site was subsequently located by Lan Fleming (reference number LO2-62H3), taken 2.2 seconds after the first. This shows that the largest of the cuspids, number 5, is considerably broader at the base than Blair originally thought. It is possible to work out the apparent height of the ‘spires’ by calculating the length of the shadow and the elevation of the sun above the horizon (which may be expressed mathematically as Height = Length of shadow × the tangent of the sun’s elevation). The largest of the objects (Cuspid 5) casts a shadow some 110 m long; given a solar elevation of 10.9°, the tallest object ought to be 21.2 m high (David Childress gives the height as 213 m!). This assumes that the lunar surface across which the shadows fall is perfectly flat, but topographical maps for the moon suggest that there is a general trend of between one and two degrees rise to the west, the direction from which the sun was shining at the time of the photograph. This means that the top of the cuspid is 21.2 m above the top of the shadow, but also that the base of the cuspid is itself up to 3.8 m higher than the tip of the shadow. The cuspid’s triangulated height should therefore be reduced by this amount, to around 17.4 m. However, that is not the only problem. These calculations also depend on the sun being a single point of light, whereas it is a disk, causing shadows to have two parts, an umbra (the region in which none of the sun may be seen) and a penumbra (the region of shadow in which a part of the sun’s disk may be seen). The angular diameter of the sun, as seen from the earth/moon system, is about half a degree, which means that the tip of the penumbra (which is what is measured as 100 m away from the cuspid) was cast by the lower limb of the sun, 0.25° lower than the 10.9° elevation already considered. Taking this into consideration, the height of the cuspid must be reduced to about 16.9 m. Furthermore, the cuspid stands on the rim of a highly eroded crater, the shadow falling into its interior. A photometric analysis undertaken by Lan Fleming suggests that the height of the cuspid is 12% of the length of its shadow, in other words 13.2 m. This makes it more or less square in profile and not at all anomalous for a lunar boulder. The remaining cuspids, all of which were suspected to be smaller, fare even less well in Fleming’s analysis. The second frame shows a similar feature to the largest of the cuspids inside the rim of a crater that, despite Fleming’s analysis, raises the question about sloping terrain and the distortion of shadows. Indeed, it is apparent from the photographs that the shadow of Cuspid 5 falls into part of an eroded crater, identified by Blair as a rectangular trench. The trench, in fact, appears to be an optical illusion caused by the overlapping of two extremely eroded craters. All in all, the claims made for the Blair Cuspids cannot be substantiated. Whilst their height was originally overestimated, it is evident that they are unusually large boulders, although boulders of comparable size were recorded close up by the Apollo astronauts. However, there is nothing about their recoverable shape that suggests they are artificially created. Their arrangement is another matter. It is undeniable that Cuspids 4 and 6 form the base of three isosceles triangles with their apices at Cuspids 1, 2 and 3, Cuspids 1, 3 and 7 form a right-angled triangle and Cuspids 4 and 5 form the base of an isosceles triangle with its apex at Cuspid 6. This might be evidence for artificiality if similar arrangements were to be found elsewhere on the moon. It is probably a coincidence, as it seems unique on the lunar surface. Moreover, given the width of some of these boulders relative to their heights, claims of mathematical precision in their arrangement depend on which point on their surface is chosen for analysis. In other words, this arrangement falls well within the mathematical probabilities of occurring by chance rather than design. Numerous other parts of the moon have been the subject of speculation. The VGL organisation used to maintain a website devoted to locating anomalous features on the lunar surface, although it has not been updated since 2002. The Ukrainian Research Institute of Anomalous Phenomena, based in Kharkov, had a lunar study programme; despite its impressive-sounding name, this was a purely amateur organisation that seems to have vanished without trace. Some of the alleged sites detected by groups like these have depended heavily on unsustainable hypotheses about structures on the lunar surface ‘revealed’ in photographs from the Apollo landings. These photographs, claiming to show glass domes in various states of collapse (and, by implication, extremely ancient), have been over-enhanced on computers and show little more than various lens and lighting effects. However, the efforts of Fleming, Arkhipov and their colleagues in Kharkov mean that the surface of the moon is subject to intense scrutiny and constant analysis. None of the proposed sites have revealed convincing evidence for artificiality, including the supposed ‘bridge’ in the Mare Crisium, first reported in 1953. Considerably less easy to evaluate are the claims of David Hatcher Childress, a prolific fringe author whose publications range from monographs on anti-gravity to lost cities of Lemuria, from man-made UFOs to ‘free energy’. His claims include not only the ubiquitous pyramids and domes (which are usually the central peaks in impact craters) but also tracks left by automated ‘mining drones’ (usually the tracks of boulders thrown by meteoric impacts), platforms or terraces, a ‘pond’, cigar-shaped objects (drawn from UFO mythology) and others. Needless to say, these claims depend on a special way of looking at the photographs: many are so grainy that more than a pinch of faith is needed to see what Childress sees. None would stand scrutiny as aerial photographs of archaeological features. This is not to dismiss them out of hand, merely a recognition that the quality of the data is frequently too poor to draw any meaningful conclusions from them, either in support or in refutation of the hypotheses. The trend of technological advance is in favour of the sceptic. 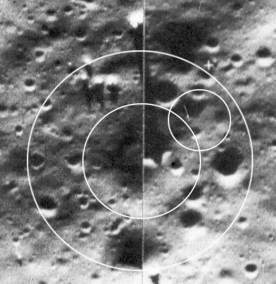 As photography and surveying techniques increase in quality, what were thought to be features (interpreted by eager lunar site hunters) turn out to be tricks of the light or of the human imagination. Ambiguity is reduced with technological advance: this is bad news for the Bad Archaeologists. So your dismissing the buildings on the moon simply cause the pictures arent clear enough…. so since the pictures dont have any “hard evidence” we can conclude that its all illusions of the mind? Well since you cant prove they arent structures with any “hard evidence” cant we say this is all opinion but you seem to make the assertion that its a proven fact that there are no buildings on the moon? Most of your website is based upon the lack of “hard evidence” and that these people want to take your money….. well have you thought about how the government takes your money and maybe if you found out that they have been lying to us for a long time we might not want to give them our money anymore? Seems to me that most of the so called “bad archaeology” are just people who want the truth to be explored not cut off or dismissed simply because the governement or whoever is keeping the lid on very tight wants you to continue to believe in them so youll continually hand your money over to them. The worse part of this is how you say these people with their quack ideas, some with the same credentials or ever more than you Keith, are amateurs and cant be taken seriously but you should be since your opinion and most other mainstream media lovers match todays views. You also said it yourself science doesnt prove anything so then how can you say any of these topics on this website are fake/false/bad archaeology? Let’s start with the end of your comment. It is absolutely the case that “science doesnt prove anything”: proof is a mathematical concept that science cannot hope to match. Science is all to do with building hypotheses and theories based on observations of the real world, using the data acquired during those observations. Science is entirely contingent upon the data it possesses: once new or better data is available, theories are modified to explain those new observations. My website is indeed “based upon the lack of “hard evidence”” because these frauds who promote their ridiculous ideas (and often do so quite knowingly) do not provide the evidence that is required by their ludicrous claims. Buildings on the moon? Show some decent photographs of them. The moon has been surveyed very well and in considerable detail over the past fifty years or so. If there are no plausible photographs of structures on the moon (and we can see things like the Apollo Lunar Excursion Module bases clearly enough), why do you think that is the case? The buildings are too subtle to be properly visible? NASA is engaged in a vast enterprise to examine every single photograph of the moon to ensure that every possible building is deliberately blurred out? What about the space agencies of other countries that have been photographing the moon? Are they in on the conspiracy? Do you even realise how ridiculous such arguments are? The people who promote what I call Bad Archaeology are absolutely not “just people who want the truth to be explored not cut off or dismissed”. They are, for the most part, authors whose living depends on selling books. If this all-powerful government (or whoever) conspiracy that you envisage is “is keeping the lid on very tight”, then how do authors like David Hatcher Childress or Richard Hoagland get their books published? It sounds to me as if this watertight conspiracy that you assert without evidence isn’t very efficient at suppressing information! And I never, ever insist that people should take me seriously because of my “credentials”, which I don’t advertise on this site beyond saying that I am an archaeologist. Arguments from authority are a well known logical fallacy. What I do with this site is give the information that the promoters of Bad Archaeology don’t want their readers to know. A lot of the time, that is the contextual information about the site or artefact that enables it to be understood as a product of an ancient culture; in other cases, it is to draw attention to inadequacies or errors in the data they use. I get a bit bored with saying so often, but it is true that it is all about the evidence: if someone like Graham Hancock were to provide robust evidence for just one of his ideas, I would accept that idea (but not necessarily the rest of the package of ideas that he wants to promote). Those ideas remain in the realm of Bad Archaeology when the evidence being used to support them is so poor. I find your site very interesting. I’ve often been disappointed in fringe books by recent authors as being too derivative of fringe books from earlier generations. They will use the same poorly reproduced photographs, the same arguments (while ignoring new research) and they seem primarily interested in selling books. If they were truly interested in the truth they would not rely on conspiracy theories or ignore research that disproved earlier assertions. In a sense, I respect the work of John A Keel more than I do that of many Ufologists today and he had both a lighter Fortean side, presenting theories that he may nor may not have believed in, as well as the honesty to state that he was not an authority on anything. I respect Jacques Vallee as well. If high strangeness is happening (and it may not be) then it’s not simple aliens as SF imagines it. The high strangeness fits in with world folklore and may not tell us what is happening but can tell us about aspects of being human. Skeptics love to point out that believers see patterns that are not there but the flip side of that study is that skeptics miss patterns that really exist. Perhaps the fringe can come up with something useful someday but there’s quite a bit of chaff to separate out from the wheat. Harold T. Wilkins was one of my favorite fringe authors that I took semi-seriously as well. He engaged in early ETH Ufology and fringe South American archeology back in the day, but he seemed to want to find out what really was going on. He once believed that aliens were staging on the moon for an attack on earth. What reading the fringe did not do for me is disconnect me from science. Too many fringe authors today are disconnected from science and the scientific method. I may reject philosophical atheism and material reductionism as the sole cause of reality, but I don’t reject the scientific method or the willingness of scientists in general to modify their theories based on the evidence. Watching the moon landings when a teenager was a high point of my life. In reading a recent book on the hollow moon I was disappointed that both sides of the evidence was not supported. I wanted to catch up on the “state” of fringe lunar speculation but found a poorly written book that actually used an argument from authority. Because Soviet scientists originally developed a space ship moon hypothesis it must be true and because people with security clearances at NASA believed in aliens, it must be true. As if the only alternative was that no scientist could be wrong or that a security clearance protects one from blind belief. I don’t think of religion as blind belief, or folklore for that matter. Both are based on anecdotal evidence which is not accepted by skeptics, but it’s at least genuine. Blind belief is holding to a belief out of wishful thinking despite the evidence that accumulates. As much as I’d like to imagine that Venus and Mars had dying civilizations and as much as I like SF, I don’t hold to that level of blind belief. I don’t have faith for the irrational, though I have faith for the personal. If anyone will take the time to download Google Earth standard and then have the interest to get some knowledge of new stuff maybe, just maybe new information may be introduced. Anyone with Google Earth can go to Google Moon and check out 22 15 34.52 N 8 19 11.13 E at eye alt -2699 ft. After you do this try reasoning out not only the design but the shadows and also measure the size. Try also checking out prospective and light playing on prospective with continuation of pattern into darkness. There are many very compelling structures on the Moon which bare undeniable evidence of intelligent design but having an open mind is essential in the process to even look. Check this one out: 19 59 04.03 N 21 11 39.42 E at eye alt. of -4963 ft. It is hard to fathom what has happened to the Moon when you come to realize what is going on there and likely has been for a very long time. There are literally hundreds of other structures I have located personally which sometimes and very similar but often different. A paradigm shift is in order for all of us regarding the Moon. The “Cuspids” weren’t impressive at all. There are plenty of rocks on this moon. It should be pretty easy to find non-existent geometric alignments from all those rocks. Good article. I see no evidence supporting the theory of structures on the moon, just some guy who connected some craters together in geometric forms. There was a kid in school who had really bad acne and I bet I could take an old school picture of him and connect some of his pimples together forming complex geometric structures thus proving aliens were contacting us through is breakouts. “I wanted to convey to you my views on our extra-terrestrial visitors popularly referred to as ‘ UFOs,’ and suggest what might be done to properly deal with them. “I believe that these extra-terrestrial vehicles and their crews are visiting this planet from other planets, which obviously are a little more technically advanced than we are here on earth. I feel that we need to have a top level, coordinated program to scientifically collect and analyze data from all over the earth concerning any type of encounter, and to determine how best to interface with these visitors in a friendly fashion. We may first have to show them that we have learned to resolve our problems by peaceful means, rather than warfare, before we are accepted as fully qualified universal team members. This acceptance would have tremendous possibilities of advancing our world in all areas. Certainly then it would seem that the UN has a vested interest in handling this subject properly and expeditiously. “I should point out that I am not an experienced UFO professional researcher. I have not yet had the privilege of flying a UFO, nor of meeting the crew of one. I do feel that I am somewhat qualified to discuss them since I have been into the fringes of the vast areas in which they travel. Also, I did have occasion in 1951 to have two days of observation of many flights of them, of different sizes, flying in fighter formation, generally from east to west over Europe. They were at a higher altitude than we could reach with our jet fighters of that time. “I would also like to point out that most astronauts are very reluctant to even discuss UFOs due to the great numbers of people who have indiscriminately sold fake stories and forged documents abusing their names and reputations without hesitation. Those few astronauts who have continued to have participation in the UFO field have had to do so very cautiously. There are several of us who do believe in UFOs and who have had occasion to see a UFO on the ground, or from an airplane. There was only one occasion from space which may have been a UFO. “And a literal translation describes very clearly a spacecraft with the ability to land vertically and take-off vertically, and it was an object that looked very much like the Lunar Module that we used on the Moon; and if it’s going to land vertically and take-off vertically, it had to come from some place and go back some place. “In my mind the universe has to be cyclic, so that in one galaxy if there is a planet maybe that has arrived at the point of becoming unlivable, you will find in another part of a different galaxy a planet that has just formed which is perfect for habitation. I see some kind of intelligent being, like us, skipping around the universe from planet to planet as, let’s say, the South Pacific Indians do on the islands, where they skip from island to island. When the first island blows up due to a volcano, they will have their progeny on all these other islands and they will be able to continue the species. I think that’s what the [alien] space program is all about. “On May 5, 1981, we were in orbit [in the Salyut-6 space station]. I saw an object that didn’t resemble any cosmic objects I’m familiar with. It was a round object which resembled a melon, round and a little bit elongated. In front of this object was something that resembled a gyrating depressed cone. I can draw it, it’s difficult to describe. The object resembles a barbell. I saw it becoming transparent and like with a ‘ body’ inside. At the other end I saw something like gas discharging, like a reactive object. Then something happened that is very difficult for me to describe from the point of view of physics. Last year in the magazine Nature I read about a physicist… we tried together to explain this phenomenon and we decided it was a ‘ plasmaform.’ I have to recognize that it did not have an artificial origin. It was not artificial because an artificial object couldn’t attain this form. I don’t know of anything that can make this movement… tightening, then expanding, pulsating. Then as I was observing, something happened, two explosions. One explosion, and then 0.5 seconds later, the second part exploded. I called my colleague Viktor [Savinykh], but he didn’t arrive in time to see anything. -Dr. Ed Mitchell Apollo 14 Astronaut, MSN Interview 10/98. It followed us during half of our orbit. We observed it on the light side, and when we entered the shadow side, it disappeared completely. It was an engineered structure, made from some type of metal, approximately 40 meters long with inner hulls. The object was narrow here and wider here, and inside there were openings. Some places had projections like small wings. The object stayed very close to us. We photographed it, and our photos showed it to be 23 to 28 meters away. .-Astronaut Scott Carpenter-Carpenter photographed a UFO while in orbit on May 24, 1962. NASA still has not released the photograph. …I’ve been asked about UFOs and I’ve said publicly I thought they were somebody else, some other civilization. -Commander Eugene Cernan, Commanded the Apollo 17 Mission-The quote is from a 1973 article in the Los Angeles Times. We have, indeed, been contacted-perhaps even visited-by extraterrestrial beings, and the US government, in collusion with the other national powers of the Earth, is determined to keep this information from the general public. Victor Marchetti, former Special Assistant to the Executive Director of the CIA, in an article written by him for Second Look entitled “How the CIA Views the UFO Phenomenon Vol 1, No 7,” Washington, DC, May, 1979. In any case, the Air Force has arrived to the conclusion that a certain number of anomalous phenomena has been produced within Belgian airspace. The numerous testimonies of ground observations compiled in this [SOBEPS] book, reinforced by the reports of the night of March 30-31 , have led us to face the hypothesis that a certain number of unauthorized aerial activities have taken place. Until now, not a single trace of aggressiveness has been signaled; military or civilian air traffic has not been perturbed nor threatened. We can therefore advance that the presumed activities do not constitute a direct menace. ;The day will come undoubtedly when the phenomenon will be observed with technological means of detection and collection that won’t leave a single doubt about its origin. This should lift a part of the veil that has covered the mystery for a long time. A mystery that continues to the present. But it exists, it is real, and that in itself is an important conclusion. More than 10,000 sightings have been reported, the majority of which cannot be accounted for by any scientific explanation… I am convinced that these objects do exist and that they are not manufactured by any nation on Earth.” “I can therefore see no alternative to accepting the theory that they come from some extraterrestrial source. The evidence that there are objects which have been seen in our atmosphere, and even on terra firma, that cannot be accounted for either as man-made objects or as any physical force or effect known to our scientists, seems to me to be overwhelming… A very large number of sightings have been vouched for by persons whose credentials seem to me unimpeachable. It is striking that so many have been trained observers, such as police officers and airline or military pilots. Their observations have in many instances… been supported either by technical means such as radar or, even more convincingly, by… interference with electrical apparatus of one sort or another…. -Lord Hill-Norton, Chief of Defense Staff, Ministry of Defense, Great Britain, 1973; Chairman, Military Committee of NATO, 1974-77; quoted from his foreword to ;Above Top Secret by Timothy Good, Morrow & Co’s Quill Books, 1988. I believe that these extraterrestrial vehicles and their crews are visiting this planet from other planets which obviously are a little more technically advanced than we are here on Earth. I feel that we need to have a top level, coordinated program to scientifically collect and analyze data from all over the earth concerning any type of encounter, and to determine how best to interface with these visitors in a friendly fashion…. For many years I have lived with a secret, in a secrecy imposed on all specialists and astronauts. I can now reveal that every day, in the USA, our radar instruments capture objects of form and composition unknown to us. And there are thousands of witness reports and a quantity of documents to prove this, but nobody wants to make them public. -Colonel L. Gordon Cooper, Mercury and Gemini Astronaut, in an address to the UN in 1985 after announcing that he had seen and chased UFOs over Germany in the 1950s. Cooper also reported a greenish object, which passed by his capsule going east to west (opposite normal man-made orbits) while in orbit in May of 1963. The object was tracked by ground-based equipment in Perth, Australia. The press was told it could not question Col. Cooper on this aspect of the mission. At one stage we even thought it might be necessary to take evasive action to avoid a collision. ;-Astronaut James McDivitt commenting on an orbital encounter he and Ed White had with a ;weird object with arm-like extensions which approached their capsule. Later in the flight they saw two similar objects over the Caribbean. Dr. Edgar Mitchell, Apollo 14 astronaut-from a taped interview. The U.S. Government hasn’t maintained secrecy regarding UFOs It’s been leaking out all over the place. But the way it’s been handled is by denial, by denying the truth of the documents that have leaked. By attempting to show them as fraudulent, as bogus of some sort. There has been a very large disinformation and misinformation effort around this whole area. And one must wonder, how better to hide something out in the open than just to say, ‘It isn’t there. You’re deceiving yourself if you think this is true.’ And yet, there it is right in front of you. So it’s a disinformation effort that’s concerning here, not the fact that they have kept the secret. They haven’t kept it. It’s been getting out into the public for fifty years or more. -Dr. Edgar Mitchell, from the same interview. I was testing a P-51 fighter in Minneapolis when I spotted this object. I was at about 10,000 feet on a nice, bright, sunny afternoon. I thought the object was a kite, then I realized that no kite is gonna fly that high. As I got closer it looked like a weather balloon, gray and about three feet in diameter. But as soon as I got behind the darn thing it didn’t look like a balloon anymore. It looked like a saucer, a disk. About the same time, I realized that it was suddenly going way from me-and there I was, running at about 300 miles per hour. I tracked it for a little way, and then all of a sudden the damn thing just took off. It pulled about a 45 degree climbing turn and accelerated and just flat disappeared. -Donald Slayton, Mercury astronaut, in a 1951 interview. Female Cosmonaut: ;I’ll take it and hold it with my right hand. Look out the peephole! I have it! Male Cosmonaut: ;There is something! If we do not get out the world will never know about this! We have contact with alien cultures. There ARE things out there! There absolutely is! Enough to make you think twice??? ?